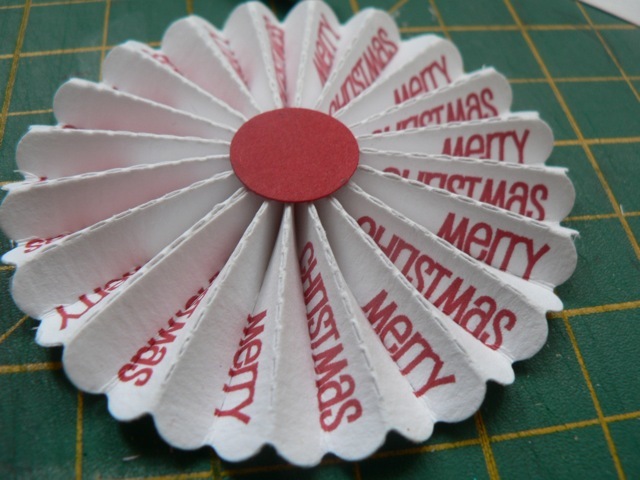 Doing the HAPPY DANCE – Tim Holtz Rosette die WoRKS! OMG – I am totally doing the happy dance right now. I thought I would have to struggle to get the words from my Rosette Word files to fit the Tim Holtz die but they work, pretty much as is!! 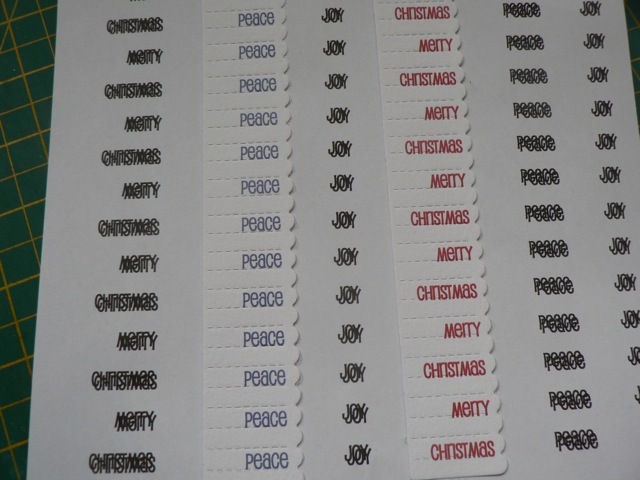 I first held a pre-cut die up over the print out, to see what sort of adjustment I would need to make. Not sure if you can see this, but the words fit near perfectly as they are. Can you see how they fall between the score lines? As Julia-the-lovely gave me a whole stack of pre-cut ones as well as the die, I thought the easiest thing to do was to attach the pre cut dies, first placing them with the window light to guide me. 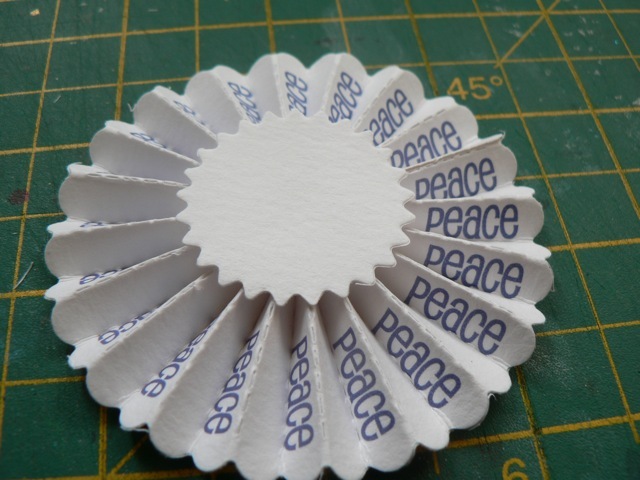 PEACE is short enough that the companion circle that the die cuts works fine. Merry Christmas is a little long, so a smaller circle works better. I’ve tried to capture the wonky areas so you can see that even so they are not half bad! 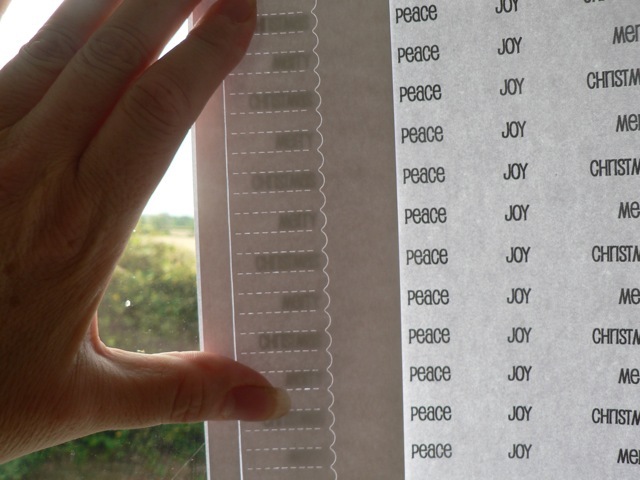 Two things – first, it may work better (but it may not) if the card stock is printed first and then die cut – but I think the same problem with slippage may occur. Second, making the words a smaller point size will def. help – mine were pretty much as big as they could be, but I can see the advantage of making them smaller. I’m just not sure that I will like that. Are you as excited by this as I am? Probably not – but I can’t believe that the most recent file works. Now I am NOT sure the previous ones do, only because I think I tried to adjust further down the list, for the slippage I was getting with hand scoring. But I will make some files for you – or you can use my instructions to make your own with any words you like – when I can. Just to add the WIP link! Categories: printables | Tags: rosettes | Permalink. These are awesome! Saw your You Tube video and went straight out and bought the T H Rosette die. Now I can’t find the file you said we could download. Please help! Thanks so very much for such a wonderful idea! https://scrappystickyinkymess.wordpress.com/2012/07/29/sunday-right-here-word-rosettes/ Has the info on how you can make your owm as well as the PDF to download of my words! I’ve just bought this die, so I’ll have to have a bit of a try with it. Well I just knew that you’d get home and play straight away…just hope the groceries aren’t still in bags all over the kitchen floor!! It works wonderfully well, well done you – they are really striking. Oh Wow!!! What a great idea. Thanks for sharing it, I cannot wait to try it. And i’ve just got the extended plates today … got to try this now! Follow-up to my previous comment: I checked again, and it’s my email provider that is the problem. I have to “allow” images first. Once I do that, the photos in your posts show up just fine. Hooray! I was just going to reply when I saw the 2nd comment. I didn’t change anything so glad you figured it out or I would have been less than helpful 🙂 And thank you for reading my blog. Glad you enjoy it! Congrats, first of all, in getting the Tim Holtz rosette die to work so well with your word printable! Looks great! Secondly (and on a completely unrelated note), I normally read and enjoy your posts via email subscription. All of a sudden, these posts no longer include your photos. Could this have something to do with the digest form in which your posts now appear on your blog?